On the day that has to be perfect, In Tents Events exceeds customer expectations every time. We understand how important the details of your wedding are to you, your friends, and your family. Your satisfaction is a direct reflection of our success. 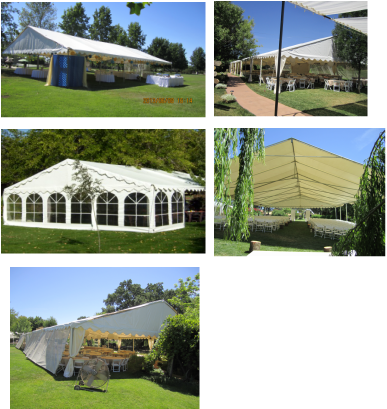 In Tents Events can cater to any wedding, no matter how big or small. We can work with almost any budget, and deliver an event that you will remember with pleasure and satisfaction, always. We offer tents with solid, window, mesh or open sides, drapery, and lighting to enable you to plan your wedding with beauty and creativity, so you will have the perfect venue, regardless of the season or weather. We have dance floors that will accommodate the largest groups of joyous revelers. We also offer stages that are perfect for any size band, a DJ, or a formal wedding ceremony. Most of all, our tents are in beautiful condition, regularly cleaned and maintained, and professionally installed, ensuring that your wedding venue will look perfect on that special day. We are happy to work with the most demanding of brides, family members, and professional wedding planners and caterers, and we'll live up to expectations every time. See our list of Recommended Vendors.